I haven’t decided what my favorite color to wear with this teal bag is yet, but it is definitely between blue and dark pink. A few weeks ago, I shared a few tips on purchasing a colored purse, so I figured I would share a tip on how to style a colored satchel. The shocking truth though ya’ll is this tip is super similar to one of the purchasing tips. 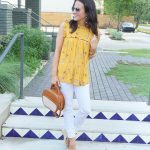 When you carry a colored satchel on a daily basis, you quickly have to love color mixing. It is a huge part of styling this purse. I am not going to wear this with a teal or green dress. I am going to style with either other cool colors like blue to slightly blend in, or with fun shades of pink or purple to allow it to pop. If you aren’t quite ready for a full on two-tone look, you can start small like in today’s outfit. 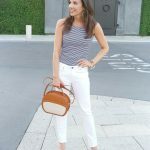 Overall my look is mainly white with the jeans and the background of the top which really allows the green of the purse to pop and take the spotlight. I also love how the green color pops against a dark pink. The print covers about half the shirt which can ease you into color mixing. If you have found a colored satchel you love and need help with what colors to wear it with, please feel free to email me (karen@ladyinviolet.com) and I would be happy to give you some style advice! I also listed some of the summer purse colors I have seen in stores below along with a few colors I would wear them with. Although, I would advise to just use as a guide because sometimes the funnest part of color mixing is putting the unexpected colors together! If you want to see more ways I have styled this bag, head to my Instagram where this bag is popping up on a weekly basis in my #ootd posts. Last, I know some of you loved this color, so I linked a few additional Henri Bendel bags that are still available in it. Love those colors together…Such a fun, bright look! You styled this all so well! Beautiful! Thanks for sharing at Tues Talk! Glad to find your site. 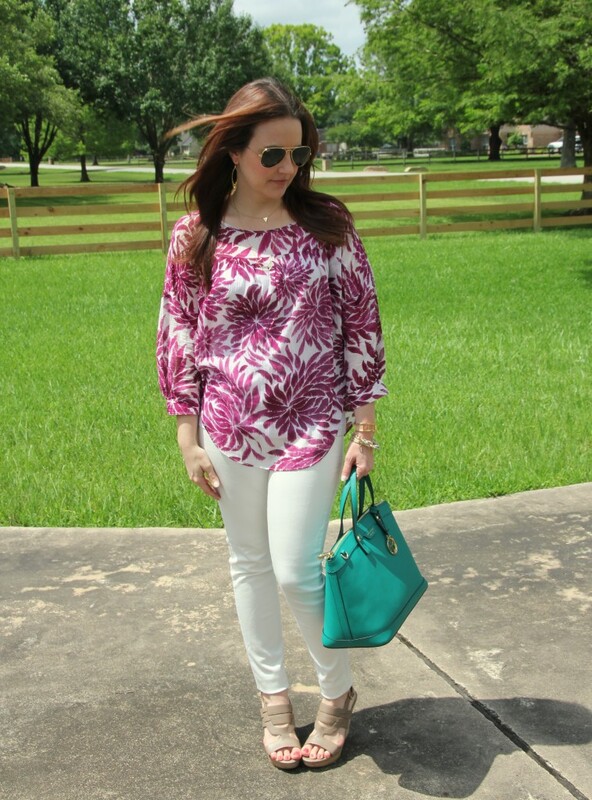 I came over on the You’ve Gotta Love Tuesday link up. Great post! You did a really nice job styling that bright satchel! I love the white, turquoise, and fuchsia combo! What a chic look, you can never go wrong with white denim!! I love the print of your top! So pretty! And the colors are perfect with your bag. 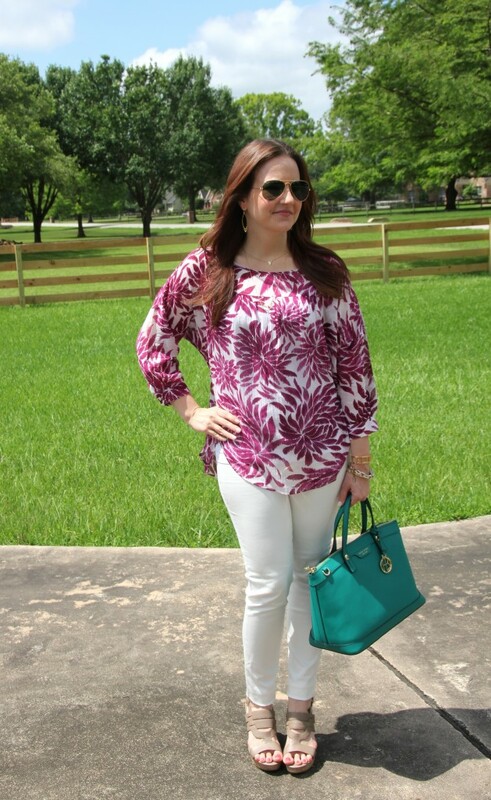 Cute look…love the printed top as well!